Its 10am on a cold Friday morning and Percy & Sam are busy finishing off the new blue circuit. Just like the last one, it sits in around the Font 5-6a mark, and just like the last one expect a few trickier ones that will make you think. A new topo for all the circuits will on the website on Monday. 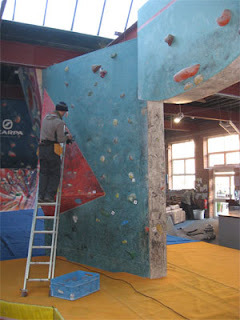 As we're talking about topo's, the new comp wall topo is now on the mats and on the website. If you've got projects on it, you've only got 2 weeks before its all change again as R2 of the Berghaus Bouldering League will take place on Friday 12th December.